Listen to "How Do Dinosaurs Choose Their Pets?" on your iOS and Android device. Come along on a playful romp as dinosaurs choose outrageous pets, shocking their parents in this fantastically comic new addition to Yolen and Teague's bestselling, award-winning series. "Can I keep it? It's so cute!" Brimming with laugh-aloud humor, enormous dinosaur children surprise their parents by bringing home a wild menagerie of highly unusual pets! What would happen if your child walked in the door with a pet tiger? Or an elephant, boa constrictor, zebra, or kangaroo? Would you smile? 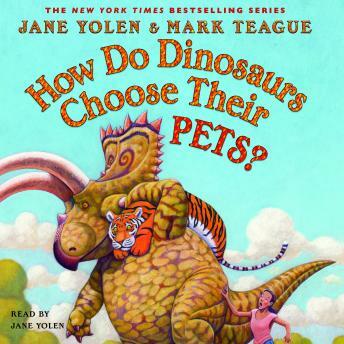 Perfect for every child who has ever loved or yearned for a pet, this new uproarious book delights readers of all ages as they peek into the mischievous world of Jane Yolen and Mark Teague's bestselling dinosaur series. In the end, children and dinosaurs both learn which animals make the most practical pets, and the best places to find them-- including shelters and pet stores. Wonderfully silly, here is the perfect book for little dinosaurs who may soon have a furry, feathery, or scaly new friend in the house. If you were as big as the dinosaurs in this book, what pet would be your first choice?